Crewest Gallery News: PRINTED II: OPENS DEC.5TH!! Crewest is pleased to announce “Printed II” an exhibition curated by Two Rabbits Studios and featuring the best selection of hand printed art posters by some of today’s most innovative street artists, activists, and designers. Opening Reception: Saturday, December 5th, 2009 from 6pm to 9pm featuring live printing by Two Rabbits. Show runs thru December 31st, 2009. As hand-printed art posters re-emerge in suburban and urban areas all over the world communicating political and social messages to everyday people, Crewest takes a moment to platform this growing genre and open its doors for the public to enjoy. 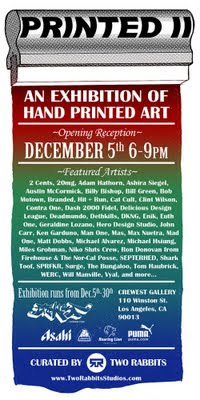 Prints, prints and more prints are what you will see in December at Crewest!